All equipment purchased for the trip was intended to be expedition grade. In fact, much equipment is designed for weekend warriors. Many suppliers are quick to offer replacements and repair at no cost to true expedition travelers... they want to keep their reputations intact. It is helpful, but one still hopes for less failures during a trip because replacement can be difficult and there is always increased risk when essential equipment fails. Fortunately, there was no complete failure of equipment during this trip. If it had continued another month, the story would have been far different. 1. Kayak skeg disintegrated not too far into the trip. Boat still usable. 2. Watch face fogged due to reaction with bug spray. 3. Map Holder started leaking and it was not possible to keep maps dry. 4. Hiking sandals - stitching came loose in 4 places. 5. Wetsuit - stitching pulled loose in 2 places. There was no abrasion in these spots. 6. Wheels (the weakest equipment of the trip) - straps abraded. Axles exhibited major metal wear, almost completely through. Wheel bearings no longer visible. 7. Paddle can no longer be broken down into halves. A slow deterioration starting about 3 weeks into the trip. 8. Compass - crack in face allowed water inside. It was a very old compass. The plan for the day was to paddle partway down the St. John River and find a place to spend the last night, camping beside the river. Got up st 5:30 and on the river about an hour later. Where the Allagash River runs into the St. John River is Two Rivers, and the dining spot Kelly's Landing. Sometimes groups consider eating Breakfast there as the reward for a successful adventure in the Allagash Wilderness Waterway. Decided to stop and see what it was all about. Hunting pictures and trophies decorate the comfortably appointed interior. Founders Tylor and Leitha Kelly started with a hot dog stand in 1976, and a restaurant in 1985. They were there eating breakfast. Ate my Breakfast and talked with several of the locals. They told me... no problem, the St. John's River drops quickly and you should have a strong tail wind all the way... you can reach Fort Kent easily TODAY!! Second time I heard that, and the competitive juices took over. It was a screaming fast trip of 38 miles in 7 1/2 hours to arrive in Fort Kent and at the Eastern Terminus of the Northern Forest Canoe Trail. Is has taken 39 days to complete the trail. "This afternoon, after paddling, wheeling, lining, tracking, pushing, pulling, lifting and cajoling my kayak and equipment over 700 miles, completed a thru-paddle of the Northern Forest Canoe Trail. A challenging and awesome adventure covering 39 days"
Towards the end of a long trip, there is a tendency to start thinking about questions such as: What will I do after the trip ends? What has happened during the trip that has changed my outlook, or changed me more fundamentally? What are the lessons learned? Is my relationship to life somehow changed and how? I believe that this is an important part of any experience, especially a longer and more challenging expedition. Answers are perhaps more personal than should be stated in this public venue, but this phase of the trip is very real and worth mentioning. Near the Cunliffe Depot Campsite is the graveyard for two Lombard loghaulers. Invented by a Mainer, these were the first patented tracked vehicles. They apparently put the earlier mentioned trains and tramways out of business since they could work all winter pulling sled trains of logs. These are the forerunners of tracked vehicles including trucks, tanks and snowmobiles. A small and well kept museum at the Churchill Dam is worth a brief stop. The Dam releases water from 8-12 daily which makes for a fun Class II run through Chase Rapids and an excellent start to the day. Camping on Eagle Lake, looked out to see some large mountains far away. The Maryland based Venturing Crew had only local maps. In paddled a couple who promptly named Katadhin (northern terminus of the Appalachian Trail), the Traveller's, and several of the other mountains visible in the distance. By morning, they were invisible in the clouds. This couple had thru-hiked the Appalachian Trail (AT), and she had also completed the Pacific Crest Trail. This trip was their test run, and they are very interested in a thru-paddle. 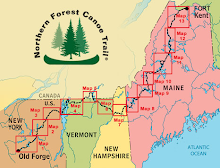 NFCT is a new trail. Will it attract AT thru-hikers, as it did me? Upon reaching Maine, contact with the outside world became more challenging. My service provider covers something like 98% of the USA. I am traveling in the other 2%. Locals say, cell phone service, no problem. Just use Verizon or US Cellular. Oh, and instead of "where are the uncovered areas? ", they say something like.... "go down the road to the first bend to the right, get out of your vehicle, go to the top of the small hill - from there you can make a call". Asking for WiFi elicits a chuckle in many cases. Maine is far more populated by trees and wide spaces than people, at least the inland areas. Paddled right past this moose feeding just upstream from St. John's Bridge. He would get his entire head and body under the water to feed on greens in the fast moving water. Stared right at me in between feeds, then kept on eating!